“To make a future with music possible for any and every individual by offering accessible, affordable products, supplemented with a staff that maintains extensive industry knowledge to address the needs of the earliest beginner to the most seasoned professional, and ultimately full customer service – including education – so as to assist every customer to find that unmistakably unique satisfaction which only comes from making music. To facilitate the love of music, to make it possible with rentals, lessons and repair all enclosed in one building, for families near and far to possess the tools which will help them to understand the importance (and the longevity) of a true musical connection. So, how does one achieve THAT? There once was a brick home in Alma, WI. This brick home housed a mom, a dad and a son. The son started violin lessons when he was just four, he then joined band in middle school, and as there was no orchestra, he played Oboe, and then Saxophone. Eventually this musically inclined son became involved in choir and marching band, but his true passion became BMX bike racing. His parents drove him far from their brick home to his many competitions, including Nationals. Eventually, in his late teens BMX racing took a relative “backseat” to the boy’s newest obsession…playing guitar. His parents drove him an hour one way to private lessons, he started playing in a garage band with other teenagers at his school, and soon realized that he had an affinity to this instrument like no other, his true love was indeed the guitar. When he graduated from the Alma High School (Rivermen! ), Tommy decided to go to college at Winona State University, where he performed in many band and combo ensemble groups, and eventually became WSU’s first Music Business Major. 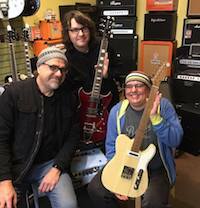 While studying at WSU, Tommy worked for a couple of music stores and decided that he wanted to open up his own – one that would eventually offer a diverse selection of musical equipment – from Brass to Strings to Winds to Lessons, Rental and Repair…but knew that that would take time and patience. He wanted to start small, to open up a few lines with companies that he admired, wanted to take time to learn how to effectively deal directly in this industry before buying a building or renting an expensive city space, so in 1993 he opened his store in its first location – in the basement of his parents’ brick home. So as not to limit the future expansion possibilities of his music store with the title of the business, he said “no” to Tommy’s Guitars, and to Guitars by Tommy, or Bentz Guitars and settled instead upon Brickhouse Music. Within two years of the inception of Brickhouse Music, Tom went to the University of Wisconsin – Eau Claire to work on his Masters, where he played in Jazz One ensemble, made some of his most valued life-long friends and created his first original rock album with his band Cartoon Water. As the music fates would have it, Tom’s musical vocations in Eau Claire would ultimately bring him face to face with a young girl who worked in the same store that he did, played in the same cover band that he did – the girl who would become his future wife, Jen Burleigh. A musical theatre performer, Jen also had been an instrumentalist in her HS, Baldwin-Woodville, and though she started her college career at UWEC as a Music Education major, she finished it with credits from three Universities, with a degree title of: Bachelor of Science: Comprehensive Theatre Performance Major…that says a lot about Jen. After becoming a musical couple, Tom and Jen thought long and hard about where Brickhouse Music should come in to its own. First thoughts for a city were Winona, Red Wing, River Falls or Stillwater. As Tom and Jen are both performers, they knew that they needed to be close to the St. Paul/Minneapolis metro area to find the opportunities in theater and for live bands to flourish, so Winona was out. Stillwater already had a owner-operated music store and Red Wing is a lovely city, but River Falls is IN Wisconsin, the home state, a mere 25 minute drive to St Paul, so River Falls became home – as has been Home to the House for 20 years. 109 North Main Street became Brickhouse Music’s first official address in the fall of 1997. 109 North Main was a downstairs entry locale, with a Gate as opposed to a door. It has faux brick on the walls, and was affordable for Tom to rent while Jen was still going to school in Eau Claire. There was one large room, one small room for lessons and a bathroom. About 800 square feet, tops. By May 0f 1998, there was an opening at 113A North Main Street – a main floor option with a basement…this would be the home of Brickhouse Music from May 1998 – May 2003. 113A had great, high ceilings, alley parking, a basement for the expansion of BHM into repair, lessons and a recording studio…which means the need for a Repairman and a Sound Engineer soon came along. Clark Thaldorf, who was a music education major at WSU, had finished a band instrument repair course and had been working in Michigan’s Upper Peninsula, came to Tom and Jen’s wedding in 1998…and the rest is history. Tom lured Clark back to Wisconsin, and the Brickhouse Music family grew. Kyle Bonderson, who had been a drummer in Cartoon Water, as well as a great friend, was also a studio engineer, and he agreed to join Tom and Brickhouse as the studio engineer and head of Velvet Brick Studios, which was built in the basement of 113A…and the Brickhouse Music family grew. As the family grew, as the student numbers grew, BHM needed room to expand. 1999 was a year of travel and change, as Jen toured nationally with the Buddy Holly Story and Tom joined Taboot – a Phish tribute band and started playing regularly with the Tommy Bentz Band, releasing the first of 4 TBB CDs of original music in 2000… Lots of travel, lots of music in the upcoming years including meeting Dicky Betts in Nashville – which is a great story! In 2003 Tom and Jen bought 216-218 South Main Street. The building that had most recently been Krueger auction services, but had in the past been Fox Hardware, among other businesses. We built 8 lesson rooms and a new Velvet Brick Studio, band instrument repair and guitar repair area. Finally BHM had a home. Within 2 weeks, there was a big storm, and Jen walked in to a new waterfall in the ceiling. Ahhh, the life of a landowner! Owning a store and a building has it’s advantages to be sure, but the the whole package can sometimes be a little bit daunting…so in 2005 BHM acquired another building – 214 South Main Street, the old photography building. 2005 was a big year for BHM. Acquiring 214, opening a store in Eau Claire (closed in 2012), Jen getting a job on Broadway in Mamma Mia. She moved to NYC for 2 years, working remotely as much as possible to help with the store, Tom flying out to visit, her flying back on her days off…two years of a great job on the big White Way was lovely, but River Falls, WI is home. Coming back to the Twin Cities theatre community was great for Jen, and she finally came to work full time at BHM…as “full time” as an actor’s life will let one be. Being professional working musicians can be a huge plus when it keeps the store on the pulse of the music industry. It can be a detriment when the owners need to leave the store for a week at time. Thankfully, some wonderful “family members” have stuck with BHM through thick and thin, and take the helm when either Tom or Jen are out of town.